My sister sent out an SOS on Facebook asking for favorite Christmas breakfast traditions. Breakfast on Christmas morning can be tricky. First of all, I don’t know many of us who are up for something labor intensive, after all of the Christmas Eve preparations. And in homes like ours the opening of the presents can last for hours, since we drag it out and open gifts one at a time, taking turns. I also know if I don’t get some protein in the AM (especially when lots of sugar is present), I will crash before long. But if you are insane, like me, you don’t want Christmas morning breakfast to be boring either. This is what we did at our house last year. I’m pretty sure we started with a banana or something before diving into the presents. 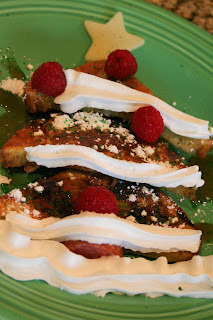 After presents, and before stockings we came to the kitchen and made Christmas Tree French toast. I’m pretty sure I got this idea from a blog (blogs), but have no idea which one(s) at the moment. French toast goes together pretty quickly. At least some of these were made with cinnamon raisin bread. We cut the toast on an angle to form the triangles with which we built our trees. Satisfying my need for non-sweet foods was our provolone cheese stars and sausage tree trunks (I think we had more sausage on the side). 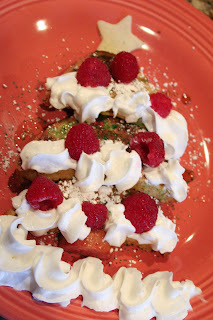 The kids had fun decorating their own trees with raspberries, powdered sugar/snow, whipped cream, and even some green sugar sprinkles, to be festive. But I think they are still festive with just a little syrup, as well! So not the healthiest breakfast, but better than a bowl of fruit loops before diving into the stocking candy. 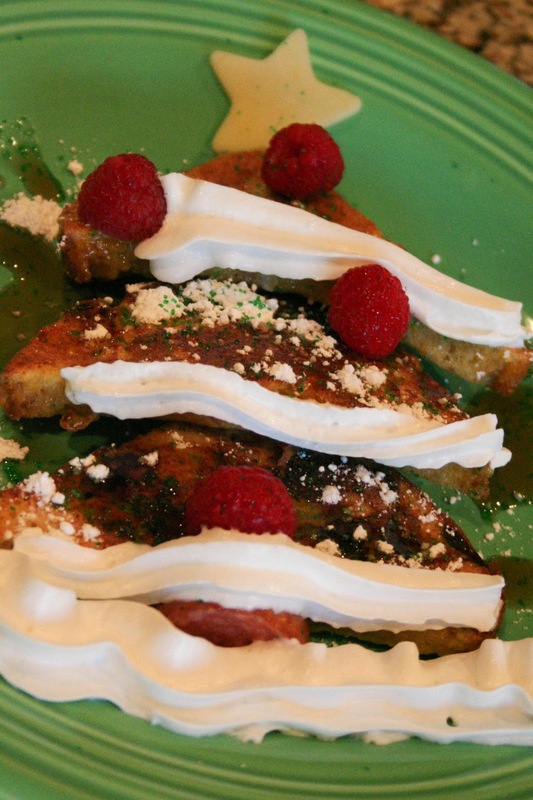 I’d love to hear your Christmas morning breakfast traditions! What’s most important to you? Ease of prep? Festive nature of the food? Non-sugariness (hmm…spell check doesn’t like that word for some reason. :-))? Feel free to link up your special recipe in the comments section, and help out those who are struggling with this dilemma. Sausage & Cheesey Biscuits EASY – Take the Pillsbury Grand Biscuits and break in half. Take 1 half and flatten a little put into a cupcake tin (no paper)…then.. cook up some crumbled sausage (I used Jones in the round package and I break it up – make day before) and some moz cheese – drop a little of each into a Pillsbury Biscuit – bake until brown – THESE ARE A HIT – can use bacon or chicken or anything really. Sweet & Sour Meatballs – quick recipe…1 can of cranberry's, 1 jar of apricot jelly and 1 container of chili sauce..mix and put your meatballs in with a crockpot.. DIVINE! Pudding w/brownies and whipped cream..forgot what this is called, but you layer it in a truffle bowl. Chocolate Cake – Happy Birthday Jesus cake. Its not a lot work and is sooo yummy! Maybe you can find something above for your breakfast? 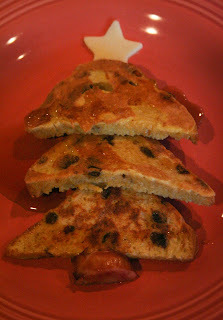 What cute french toast trees! I haven't tried this yet, but I just heard today of someone putting breakfast in everyone's stockings! Have everyone open their stockings first and inside they'll find a piece of fruit, a yogurt, hardboiled egg, individually wrapped muffin… Or whatever your family likes. I want to try it this year! i LOVE the french toast trees! my 3 yr. old grandson would like these. we have had the tradition of christmas brunch for some years now. i make gingerbread pancakes with applesauce heated with red hot candies. YUM! i make fruit salad, some sort of side dish and coffee. we love it! We were just discussing what to have for breakfast and decided on gingerbread pancakes…super easy since they are made with a box of gingerbread mix. But I will have to remember these trees for next year. I bet the whip cream would be a big hit with my daughter. We don't go too all out because we go to a big Christmas Eve morning brunch at my mom's house the day before. It's a big delicious meal, all the better because I don't have to make it! I love the trees! We will definitely be stealing this idea for Christmas next year when we stay at home in Virginia! This year we traveled home to Connecticut and are staying with my parents. Mom does a big Christmas morning brunch spread for the whole family and anyone else that stops by. Scrambled eggs, sausage, bacon, quiche, monkey bread, bagels and english muffins, fruit salad and Christmas cookies! We munch on crab and artichoke dip in the afternoon and make turkey surprise sandwiches to enjoy by the fireplace for dinner! We usually do a breakfast casserole as well. Make the night before…let it cook while we open and then it helps with the sugar overload! Do you have any great Valentines Food ideas? What about mardi GRAS?